Even though Intel unveiled its Vaunt smart glasses earlier this month, insurance provider VSP has actually been working on its own take on smart eyewear for well over a year now. It's called Level, and while it won't offer heads-up notifications like the Vaunt, it does feature activity tracking and calorie counting. Think of it as less of a Glass successor, and more like a Fitbit you wear on your face. Now, after nearly a year of beta testing, VSP is finally ready to bring Level to the public for the first time. It will cost $270, excluding lenses. As a reminder, here's how the Level works. Inside each pair of Level glasses are a magnetometer, an accelerometer and a gyroscope, all of which is housed inside the left temple. They track your steps, calories burned, distance and the total activity time, which is very similar to what most other activity trackers do. There's also Bluetooth for connecting with a companion app, plus a battery that lasts about five days in between charges. Also on the left temple is a microUSB charging port hidden inside the hinge. The app has a few uses beyond just activity tracking as well. You can also use it to connect with friends and, perhaps my favorite, find your misplaced frames with a "Find My Glasses" feature. There's also a charitable component to the app, which syncs up with VSP's Eyes of Hope initiative. Points are awarded to those who achieve their daily step goals, and once you get 50 points, VSP will give away a comprehensive eye exam and eyewear to someone in need. You can choose whether you want your donation to benefit veterans, children, the elderly, or the homeless. Level was originally called Project Genesis, and it was born out of The Shop, a thinktank innovation lab within VSP. The theory behind Level was this: Wrist-worn wearables are often abandoned, either because they're not stylish enough, or people just forget to wear them. But if you stick the guts of a Fitbit-like activity tracker within a pair of glasses -- that some people have to wear everyday anyway -- then the adoption rate would be much higher. And, according to a pilot test done by the University of Southern California's Center for Body Computing, that turned out to be mostly true. Of the 284 employees that signed up for the Level trial, 221 ended up sticking with the platform for the full 15-week duration of the study (nine people never participated at all, while 54 dropped out mid-way through). 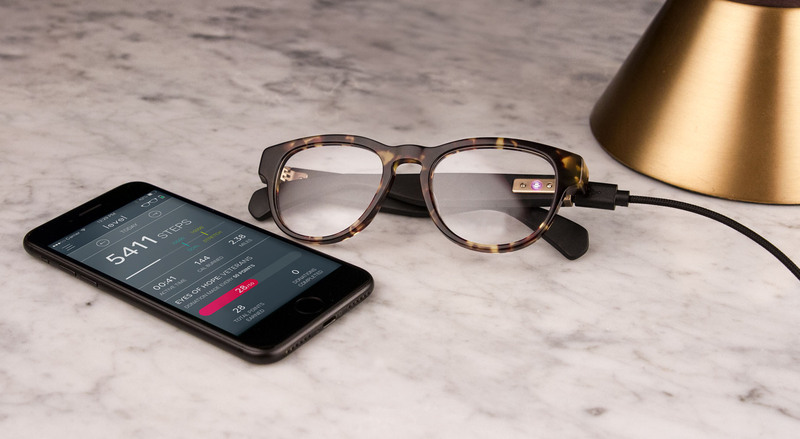 According to the research, subjects much preferred having the activity tracker embedded in their prescriptive eyewear, rather than having to put on a separate wearable. Other factors proved helpful as well, like motivational prompts and encouragement from friends within the app. Of course, another factor was the Level's design. It needs to look like a stylish pair of glasses. "As proud as we are of the technology and the platform, we also knew that to be considered truly 'smart,' these frames had to be beautiful and well designed," Leslie Muller, co-director of The Shop, said in a statement. That's why the Level comes in three unisex styles that are made in Italy through Marchon, VSP's eyewear division. The frames are made out of cellulose acetate, come adorned with stainless steel accents and will be available in black, classic tortoise, slate grey or grey tortoise. Level will officially launch in a few select markets to start: Sacramento, CA in March, and Seattle, WA; Portland, OR; Denver, CO; Minneapolis, MN and Washington DC in April. Though the $270 price might seem high at first, that's actually well in line with the price of higher-end frames, except that the Level comes with a bonus built-in activity tracker. Also, those with VSP insurance can always apply their vision benefits to get the glasses, thus lowering the price. With Intel exploring head's up displays with Vaunt and Level entering into the market, it seems that smart glasses could very well be the next-generation of wearables. At least for those who like wearing them in the first place.